Thank you to Paul Wulff who is once again sharing his views on a book that has been adapted for the movie screen. I asked him to provide some thoughts on the 1996 version of James and the Giant Peach. Lane Smith, this week's birthday author, was the conceptual art designer for the movie. I have mentioned in several articles in the past that when Hollywood gets a hold of something that makes money, they usually don’t like to steer away. This is why we see a lot of superhero movies, books turned to features and a lot of sequels. There has not been an original idea that has come out of Hollywood except Avatar and Inception and they both took from other films. Regardless, in 1993 a little film called The Nightmare Before Christmas came out. It came out to modest numbers but is nowhere near the cult classic it is today. The film was banking on the first words of the film, “Tim Burton’s” since his original films (BeetleJuice, 1988) and takes on the classic superhero (Batman, 1989) were huge successes and very marketable. Since, Green Day created a musical out of their last two albums, I am waiting for the day that Broadway takes the rights and makes a musical out of Nightmare (even though the film can be considered one). The stop motion animation was reminiscent of the old Rudolph and Santa classics of my childhood. The subject matter was great and quite original as well. I still listen to the soundtrack to this day and my girls ask to “watch Jack” every Halloween and Christmas. 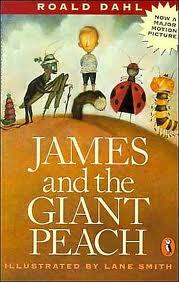 Fast forward three years and we come upon James and the Giant Peach. Same stop motion animation as Nightmare but not as successful even though it was the second collaboration with Tim Burton and Henry Selick. I bet many people heading into the film was expecting a lot more because the ads told the audience, “From the makers of The Nightmare Before Christmas.” The major difference between the two films that stood out was that when the story of James began, the actors were live action. If I was to compare it to a recent film, I would say that the live action portions of the film mirror A Series of Unfortunate Events. James, his parents, and his aunts were all quite real until a twist in the story came about and (borrowing from Jack and the Beanstalk and Cinderella) he was sent to live with his nasty aunts after a classic and typical Disney end to his birth parents, treated terribly as their servant/slave and then in a chance encounter given magic…crocodile tongues to curb his hunger. Well, these tongues turned into a, you guessed it, beanstalk…err…giant peach. To escape his aunts, James climbs inside the peach where to the audience’s surprise, he comes out the other end animated. This does not interrupt the flow of the film but I did not understand why he had to be live action in the beginning. Were the makers of the film borrowing from Wizard of Oz when Dorothy went from black-and-white to color? No one is sure but it sure felt that way. It was the filmmakers’ way of separating from real life to fantasy. Also, James is accompanied by life size bugs. 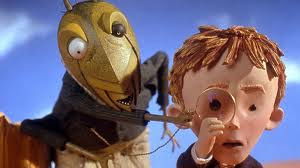 We are not clarified on if James shrunk or if the bugs grew as the peach did in the first act of the film. We only know that James had seen these insects previously when he was live action but is much more talkative, ornery and quite as bizarre. The similarities abound in this film from Nightmare to James. Not only are they from the same creators, the same dark tone, the same stop-motion animation, there are also songs in both. Now none of them are as memorable as the Nightmare songs are but they still move the film along. There are adventures, dangers and heart-felt discussions as they travel around the globe that covered London, the Arctic and New York. The greatest similarity does not come from the comparison to both movies but to the book by Roald Dahl, the animation in the book created by Lane Smith and the film itself. Tim Burton has a history of keeping to the source material (see Charlie and the Chocolate Factory) and he as well as his collaborators took each character and plucked them out of the book. When I first saw the book, it wasn’t until many years later as a teacher. My first response to seeing the drawings in it was pure amazement. They were quite similar as you can even see with the comparison from the cover of the book. Below you see James and Mr. Old Green Grasshopper. It is amazing the book drawings to the film and Tim Burton along with Henry Selick did quite the nice tribute to both Lane Smith and Roald Dahl. In the end, I liked the book and the way that the characters jumped off of the page. As a movie itself, I did not care for the live action portion and the aunts were very over the top and extremely mean to James. The films literally takes off when James, along with the peach, begins it’s ascent and the stop-motion-animation begins.